An ancient market town with one of the mildest climates in Britain, perfect for the beautiful gardens that specialise in plants that cannot be grown in the open anywhere else in England. Trengwainton Garden is a wonderful example of this, and is one of the many National Trust properties in the Penzance area. Dominating Mounts Bay is the unique island of St. Michael’s Mount, the twin of Mont Saint Michel in Normandy. On this small island stands a castle and 12th century Benedictine priory, accessible from the mainland at low tide by foot by means of a causeway. It overlooks the four miles of sandy beaches between Penzance and Marizion. In Cornish, Penzance is know as “Pen Sans”, or “Holy Headland”, and is the heart of Penwith, the Land’s End peninsula. It radiates its long history taking in the sacking of the town by Spaniards, wonderful Regency, Georgian and Victorian architecture, fishermen’s cottages and a range of different museums and galleries. There is also a great deal of maritime knowledge stored here in many guises. 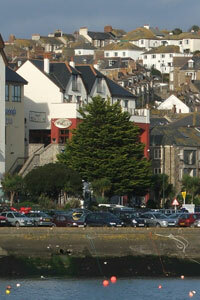 There is no shortage of accommodation in Penzance and the surrounding area. Another of Cornwall's well established resorts, this area has a history of catering very well for holiday makers. You will find holiday parks, hotels and guest houses. Just south of Penzance you will also find The Lizard with luxury self catering at Coverack along with Helford cottages in the village overlooking the beautiful river. Holiday cottages are available from Lizard Holiday Cottages, see their website here. Penzance lives up to its reputation of being a prime holiday destination while providing much for local residents to enjoy. There are many sports that can be indulged in ranging from Canoeing, rugby and golf to sailing, diving and fishing. Entertainment in Penzance also includes nightlife that is vibrant, with night clubs and pubs providing very varied music. 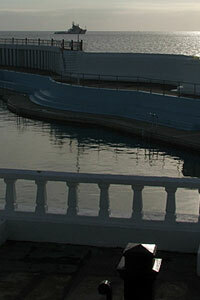 There is a cinema and theatre in the town, while the open air Minack Theatre is only a short drive away. When it comes to eating out in Penzance, there is no chance that you will be disappointed; the town claims to have more eating places than New York (per resident that is). The Inns and pubs provide good wholesome food, and there are many fast food establishments. These compliment the variety of cuisine found here including Mongolian, Cantonese, French and Italian. There is a good variety of high standard restaurants of the sort that we now expect to find in Cornwall. Shopping in Penzance is very good, and as the capital of West Cornwall, the town caters for the needs of all the Land’s End peninsula and much of the area to the east. It holds well over four hundred separate establishments covering every need you could imagine, and also features the impressive Wharfside Shopping Complex. Shops in Penzance include local specialists and recognised chains, side by side. There is plenty here to see and experience. Mounts Bay has good surf, but comes into its own during the winter when the North Coast can be too big. Close by are some exceptional beaches, Sennen Cove, Porthmeor at St. Ives, and Porthleven. The British Surfing Association is based, and was formed, here in Penzance. Penzance makes an excellent base to surf the beaches of Penwith where there are surf schools, hire and shops. Connections to and from Penzance are well established and frequent with a railway and coach stations. The railway station is a eye-catching Victorian structure. 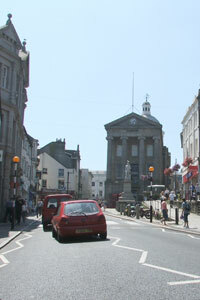 Penzance can be reached easily from all parts of the country. There are also local bus services and taxis readily available. Car and bike hire also contribute to any travel needs. On top of this, there are air and sea links to the Isles of Scilly. Helicopter, aeroplane and ferry connect the town to the islands. The Heliport is easily found on the outskirts of the town, details can be found in our Transport and Sightseeing section below.